A five-time Moth GrandSLAM winner and bestselling novelist shows how to tell a great story -- and why doing so matters. Whether we realize it or not, we are always telling stories. On a first date or job interview, at a sales presentation or therapy appointment, with family or friends, we are constantly narrating events and interpreting emotions and actions. 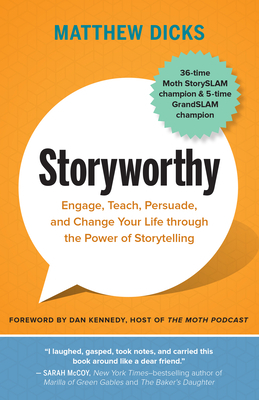 In this compelling book, storyteller extraordinaire Matthew Dicks presents wonderfully straightforward and engaging tips and techniques for constructing, telling, and polishing stories that will hold the attention of your audience (no matter how big or small). He shows that anyone can learn to be an appealing storyteller, that everyone has something "storyworthy" to express, and, perhaps most important, that the act of creating and telling a tale is a powerful way of understanding and enhancing your own life. Matthew Dicks is a bestselling novelist, thirty-six-time Moth StorySLAM champion, and five-time GrandSLAM champion. In addition to his widespread teaching, writing, and performing, he cofounded (with his wife) Speak Up, which produces sold-out storytelling performances throughout Connecticut, Massachusetts, and New York at least once a month. He lives in Newington, Connecticut.